Early last month the Democratic National Committee-sanctioned Unity Reform Commission convened for their second meeting in San Antonio. While the agenda at the first meeting in May in Washington, DC served to provide an overview of the nomination process to the members of the commission, the San Antonio meeting was dedicated to drilling down on a couple of specific issues. Mainly, time was spent hearing from a series of presenters and discussing 1) the overlapping/diverging interests of state governments and the parties in the presidential nomination process and 2) the idea of drawing unaffiliated voters into the process. FHQ has spent (and will likely continue to spend in the future) an inordinate amount of time discussing the former agenda item, particularly through the lens of presidential primary scheduling. However, here I will focus more on the latter agenda point; those unaffiliated voters. Typically national parties, if they have weighed in at all during their nomination rules making over time, have tended move in the opposite direction. That is, the national parties have been guided by an impetus to make the nomination process one where only registered partisans participate rather than opening up the floodgates to those outside the party. The principle from the party's perspective, for better or worse, has most always been, "if you want to participate, join the party." At the state level, the story is different and varied. 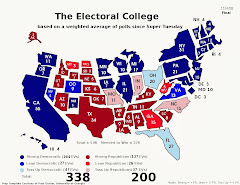 There, most but not all states utilize a primary as the means of allowing voters to express their presidential preference, the results of which determine the delegate allocation to candidates. And therein lies one of those aforementioned points of overlapping jurisdiction. State parties, by opting into the government-run and funded primary cede in part some of their ability to directly determine the parameters of the election. That is clearest on something like the date of the contest. It is state governments that make that "when" determination whether or not either of the state parties is on board. And that same relationship exists to a slightly lesser degree where participation is concerned. By opting into a state government-funded election, the state parties yield to the state government to decide which voters can participate in a partisan primary. Unlike setting the dates of those various contests, however, state parties have been more willing to challenge the extent of state government control over determining who can vote. And those challenges -- Tashjian, for starters and some of the blanket primary cases such as California Democratic Party v. Jones -- have tended to find the courts siding with the parties, emphasizing the private organizations' freedom of association protections. But not all state parties have or have had conflicts with the decisions made by state governments. Those state parties are, on the one hand, fine with more open processes that allow them to woo independents and/or those affiliated with the other party. But on the other hand, some state parties are perfectly happy with state laws dictating a closed primary. And as Meinke, et al. (2006) found, the ideological proximity of the state party to party registrants in a state has a significant bearing how open the process is. If there is convergence between the party and rank-and-file partisans, the primaries tend to be more open. But the wider the distance between the two, the more likely it is that the state party makes some attempt to protect their position by closing off the process to partisans of their own party or limiting participation even further through a caucus/convention system of nomination. Of course, other state parties have not challenged those conflicts at all through legal channels, opting instead to leave well enough alone or to seek a solution through advocating for legislation making the necessary changes to who can participate. 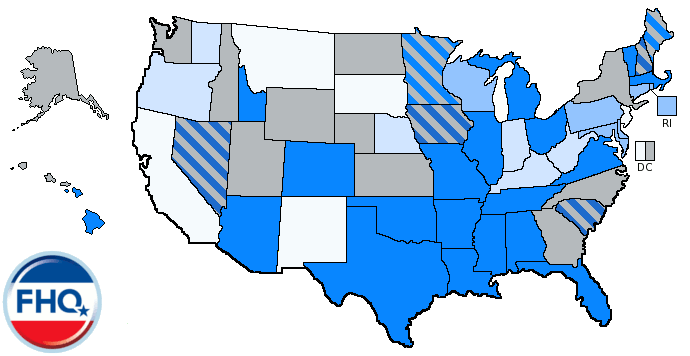 A final subset of state parties have chosen to (attempt to) opt out of state-funded primaries altogether at the presidential level and on down the ballot. It was this last subset that was most active during the Obama years. Tea Party and Ron Paul-aligned state Republican parties pursued -- mostly unsuccessfully -- a path of nominating candidates via low turnout caucuses closed but for registered partisans. Yet, that action -- state parties attempting to create a process closed to those outside the party -- was consistent with how the national parties have tended to behave (when they have sporadically chosen to attempt to intervene on the matter). 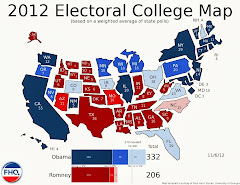 In fact, in an extension of the Tea Party maneuvering of the Obama years, a proposal was discussed and debated in the Convention Rules Committee meeting preceding the 2016 Republican National Convention to provide incentives to states with closed presidential primaries. But the Democratic Party did not follow a similar, parallel trajectory at their 2016 national convention in Philadelphia. Rather, the pressure from Sanders delegates and supporters was to open the process up. That push, along with that on other points of contention like the superdelegates issue, culminated with the charter that created the Unity Reform Commission in the first place. However, while there were clear guidelines in that charter regarding the recommendations the commission would make with respect to superdelegates, the language on the open primaries question was more passive. Mainly, that is due to the some of the complexities described above. Now that the Unity Reform Commission has had this discussion, though, there are a couple of points FHQ would raise on open primaries. One is semantical. The other is a recitation on a theme I have raised a few times since primary season in 2016. While "open primaries" is often the shorthand used, they are not necessarily for what the Sanders folks have been pushing. And that is pretty clear in how the URC dealt with the issue. The approach of the commission was about attracting unaffiliated voters instead of an outright call for open primaries. There is some nuance there that is absent in calls for open primaries. After all, Sanders did not fare all that well in open contests. Many of them were scattered across the South, where Clinton idd better than the Vermont senator, especially among African American voters. Looking at the wins each viable Democratic presidential aspirant had in 2016 (by contest participation type), Sanders clearly bested Clinton in states that held caucuses rather than primaries. Clinton only won in the earliest two caucuses in Iowa and Nevada. On top of that, her numbers were buoyed in the territories that held caucuses. But this was a category -- arguably the most closed of the bunch -- Sanders ironically dominated. Sanders also had a 4:1 advantage in the states where law allowed unaffiliated voters to participate. 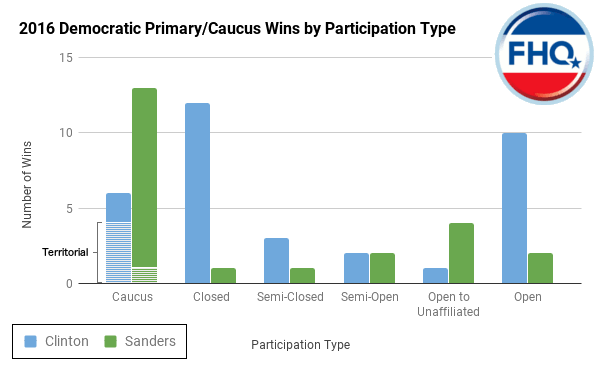 But Clinton dominated on either end of the spectrum in both completely closed and open primary states. The former was the true sticking point among the Sanders set as Sanders lone win in a closed primary was in the late calendar Oregon primary. The impetus of the call for change through the Unity Reform Commission, then, are those closed primaries. It is really a call fewer closed primaries or for more openness, not necessarily more open primaries. Yes, this differs from what is happening on the Republican side -- the pressure there is in the opposite direction -- but that does not make a full scale change to more open primaries or incentivizing an increase in their number at the state level any more likely. The answer lies in the fact that Democrats are in an inferior position relative to their Republican counterparts in state governments across the country. 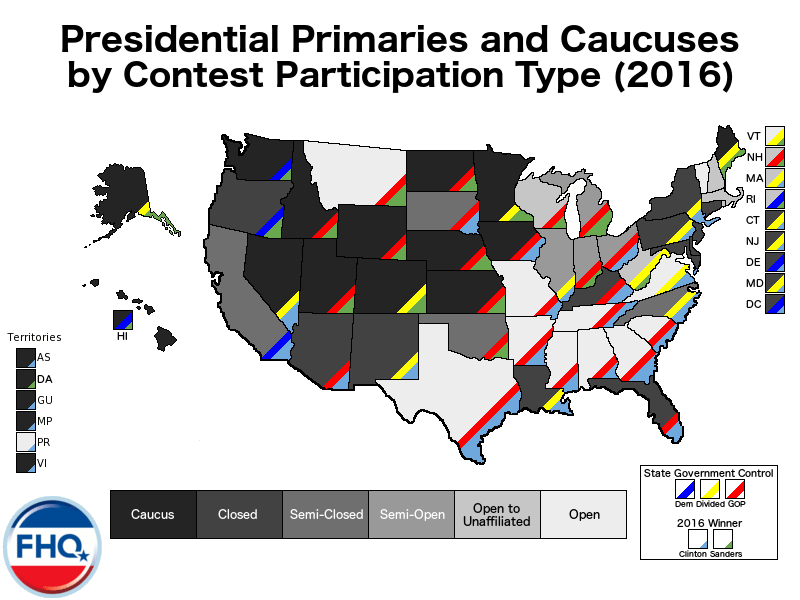 There are a lot of red and yellow stripes across the closed primary states in the map below. Republicans have unified control of more state governments, they control more state legislative chambers and they control more governor's mansions. 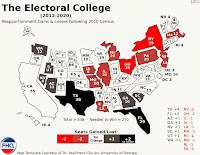 That may change in the elections in New Jersey and Virginia later this year and/or in 2018, but that will not necessarily be clear when the Unity Reform Commission is making its recommendations (by the beginning of 2018), nor when the Rules and Bylaws Committee (and the DNC later) will finalize the 2020 rules in the late summer of 2018. And even if Democrats improve their position on the state level in 2018, bringing about a change on the openness of the primaries may continue to prove difficult based on the mix of partisan control and local custom on a state by state basis. That circles back around to the Meinke, et al. conclusion above. There is a reason the Rules Committee stalemate -- delay really -- yielded firmer guidance on the superdelegates question than on either the caucus-to-primary or open primaries questions. It was an issue the national party could more easily dictate. The latter two require some interaction with governments in the various states. And legislative action is just as difficult on the state level as it is in the national capital. It is a heavy lift and on open primaries, one that is political to say the least. Set your expectations accordingly. In the earliest stages of the 2020 presidential election cycle, there has been little maneuvering on the nascent calendar of primary and caucus contests. However, the state that seems most likely to shift in 2017 in anticipation of the next nomination phase is a big one. The question that emerges from the legislative action in California is where in March the Golden state will settle on the calendar. March is the destination in the two bills that have worked their way through the originating chamber -- one from the Assembly and one from the Senate -- to the cusp of final votes across the capitol. But they are not companion bills, nor has any effort been made to reconcile the two pieces of legislation with each other. On the Senate side, AB 84 made it out of committee late last week with a unanimous green light to move the primary from the first Tuesday after the first Monday in June to the first Tuesday after the first Monday in March. But the Senate -- including the same Senate Committee on Elections and Constitutional amendments -- had already passed the more complicated SB 568. That bill would also move a consolidated California primary from June to March but to the third Tuesday in March (with an option for the governor to move the election up even further). The same has been true on the Assembly side. The Assembly bill made it through its initial chamber and has made it through the committee stage on the state Senate with no amendments aimed at reconciling the two bills. And the differences extend beyond a conflict over the date of the primary election in presidential election years. There is also a discrepancy with respect to the timing of the primary in midterm years. The Senate's governor's option bill would move the primary to the third Tuesday in March in both presidential and midterm years with the allowance that the governor may move the primary to an earlier date from the proposed earlier late March baseline. Yet, the Assembly version would maintain the June primary date in midterm years while shifting the consolidated primary to early March in presidential years only. Neither version has seen much resistance along the way despite the differences. As such, it may be that the state legislature will defer to the governor to decide which version to sign (or veto them both). Regardless, it should be noted that small changes to the Senate version in the Assembly will ultimately send the legislation back to the Senate if it passes the Assembly. That version, too, received a second reading on the floor of the Assembly, but was referred to the Appropriations Committee. That more complicated version -- with the governor's option -- may end up bottled up there with the more straightforward Assembly version pushing through to the governor. The slow march (in an even slower year for presidential primary movement) continues in California.